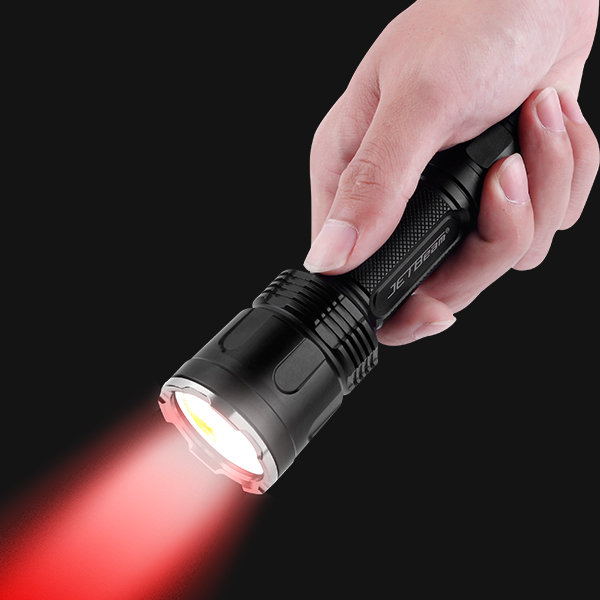 JETBeam Hunting Flashlight WL20 with Multiple Light Source is offical Released, News-JETBeam Electronic Technology Co.Ltd. JETBeam WL20 is one of best auxiliary tool for hunting. It comes with white, red, green colors and easily switched by rotating torch body or head in any direction. Patented tail switch technology provides four type brightness adjustment and momentary on/off and strobe. This method of mode switching optimizes lighting output and effectiveness. It is fitted with CREE XPG3 S4 1A LED （white） red LED， green LED . The white light delivers a max output of 1000 lumens and beam distance of 254 meters, the red light delivers a max of 125 lumens and 300 for green. The light is powered by one 18650 Li-ion battery with USB charge port and is also compatible with cold-resistant CR123A batteries. This model is a must-have for hunting and most tactical demands. Click to learn more about the WL20.